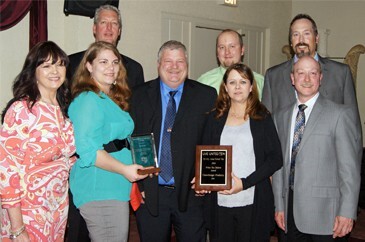 ChemDesign’s efforts in business, employee development, industry leadership and community outreach put them at the top of the list to receive the 2014 Business-of-the-Year from the Marinette Menominee Chamber of Commerce. Michigan Works! presented the award at an annual dinner and awards ceremony on Thursday, May 15 at Little River Country Club in Marinette, Wis.
Business: Since its founding thirty years ago, ChemDesign has fostered a progressive and vibrant business climate in the Marinette/Menomonee region. ChemDesign’s solid growth is a result of making chemistry work for leading chemical companies in several specialty markets, including agriculture, surfactants, additives, and specialty polymers. Employee Development: ChemDesign employs 119 people and partnered with 91 local companies in 2013. They employ veterans from the Army, Navy, Air Force and National Guard. Industry Leadership: Dave Mielke, president and CEO, was recently elected to the National Board of Directors for the Society of Chemical Manufacturers and Affiliates (SOCMA). ChemDesign has also received national awards from SOCMA for their educational outreach in the Marinette/Menomonee region and for performance improvement initiatives. Community Outreach: The company is committed to helping community organizations and supports them through board memberships and other leadership roles. The list of local communities include Marinette Menominee Chamber of Commerce, Fore Their Future, STEM Days, Healthy Youth Coalition, United Way, Tri-County Human Resources Association, Benevolent and Protective Order of Elks. During periods of high growth, recession and change, ChemDesign has been a stalwart for citizens, always staying true to providing above average wages and consistently supporting local charities and suppliers. Founded in 1982, ChemDesign is one of the leading providers of custom toll manufacturing services to the global chemical industry. The company has developed a strong reputation for partnering with blue-chip customers, utilizing its technical personnel, flexible manufacturing facilities and process optimization capabilities to produce highly complex chemicals. Tags: ChemDesign, Marinette Menominee Chamber, Michigan Works UP! This entry was posted in News and tagged ChemDesign, Marinette Menominee Chamber, Michigan Works UP!. Bookmark the permalink.